It's great fun to watch the children's faces when they see the most detailed inflatable ever built. Animals of every shape and size have come aboard \Noah's Ark\ to play, bounce and slide with all of the children. There are so many colorful animals; will the children be able to find Noah? An old time favorite game that just doesn't get any simpler. Pick a number and give the wheel a big spin. If you are lucky enough, the wheel is sure to stop on your number. All ages. A new twist on the classic bean bag toss game, On The Edge participants try to balance a bean bag on the edge of a \shelf\, and it is much harder than it looks! Ages 4 and above. Do you remember the classic Operation Game? We have super-sized Cavity Sam into a 6' X 3' table game with working lights and buzzer. Do you have the skill to remove Cavity Sam's \broken heart\ or the \water on his knee\? We love this \new\ classic and we are sure that you will also. You have seen it in Las Vegas and now you can have it at your next event! Allison's Fun Inc. is the first to welcome the oxygen bar craze to Oklahoma. Sit down, relax and enjoy the 8 different aromas. Perfect for your next casino, college party, trade show or corporate event! The 25th anniversary of Namco's most popular games is out! 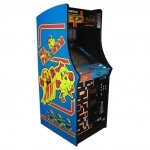 The arcade version of Pac Man, Ms Pac Man and Galaga are combined together into one popular stand up cabinet. Set on free play, this game will have a line nonstop at your next event! Speed Paintball is a blast to play but everyone can do without the sting and danger of real paintballs. INTRODUCING PAINLESS PAINTBALL LASER GUNS! Just like a real round of Speed Paintball but our indoor/outdoor laser guns involve no mess or pain, just tons of fun. Painless Paintball is a quick moving game that is a blast to play and fun to watch. All equipment is provided including our NEW 30'x30' inflatable Castle Arena and 7 guns. Want to make a friend? All you have to do is toss peanuts to our friendly elephant and you will be the winner. All ages. You have one hungry pelican here and he wants some fish! Test your aim and try to feed Pelican Patty a little fish for lunch. A great inflatable game for Kiddy City. Ages 3 through adult. You wanted a different game and we came up with one! Our pick of the year for most unique is the Penguin Fish Fling. Those penguins can't feed themselves and it is up to you to toss the fish into the penguins' mouth. Oh I forgot, you launch the fish with our specialty built foot fish launcher! Ages 6 and above will enjoy this totally different and fun large carnival game. It's always been fun to take your picture with your friends, but we have taken the photo booth to the next level. Taking the picture is the easy part, the hard part is trying to decide which of the 8 photo layouts to choose, then are you going to morph your picture into something crazy and zany, and then what about decorating your photo via the touch screen with hundreds of \props\ and sayings? The possibilities are almost endless. Quick printouts and the user friendly touch screen assures everyone a chance to use the Star Blitz Photo Booth. Enjoy the traditional summer game that gets everyone involved. All ages can enjoy this 2 x 4 player game indoors or outdoors. Fire your cannonballs and try to hit the awaiting Pirate. Well placed hits are sure to sink the Pirate's Galleon. All Ages. The S.S. Buccaneer features the stylish look of a Spanish galleon on the high seas. Beautifully designed as a climb, slide and bouncer. The Buccaneer is a true favorite for pirates and children of all ages. Our version of the giant rocking ship is now ready to sail into our event. The aggressive rocking action of the Pirates Revenge makes it a great ride for all ages and perfect for adults to ride with their children or to enjoy alone. Two crew members race head to head changing a real tire as quickly as possible on our NASCAR backdrop. Not only is it a blast to participate, it is a hoot to watch. You can't imagine all the possibilities with this new game. The traditional Pool Table is always a good choice. All ages enjoy this popular game played on an indoor/outdoor table with accessories for four players at a time. It’s not a party until the Moonbounce is set up! Always fun and popular, the Moonbounce is the all time favorite for any child. Guests quickly join in for POPNOGGINS, a hip entertainment product utilizing \green screen\ technology to superimpose guests heads onto animated dancing bodies. They're hysterical! Up to six people at a time sit on magical stools as they perform to great tunes such as \Mony Mony\, \Tub Thumping\, a little Elvis and a bit of Cyndi Lauper. Each guest gets to take home a copy of their newly created masterpiece on DVD! Includes Fun Tech.